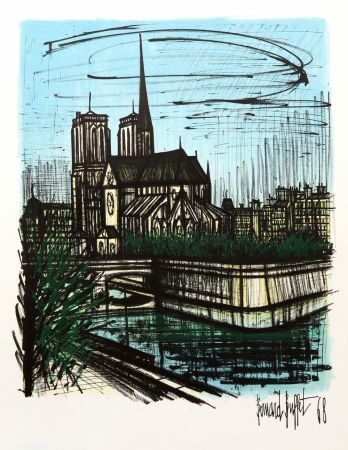 1928 - Bernard Buffet is born in Paris. 1943 - Bernard Buffet studies at the Ecole Nationale Supérieure des Beaux-Arts of Paris during two years. 1947 - Bernard Buffet exhibits an artwork for the first time at the Salon des Indépendants. This very same year the Museum of Modern Art in Paris buys a painting from the artist. 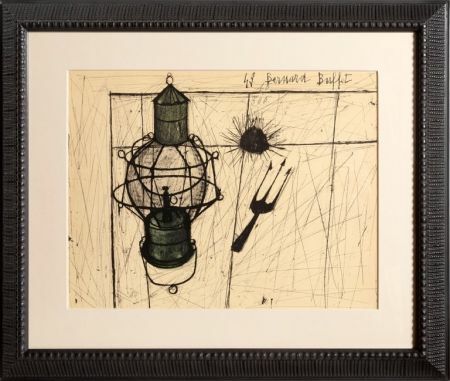 1948 - Bernard Buffet designs sets for the competition "Concours des Jeunes Compagnies". 1949 - Bernard Buffet receives the award Prix de la Critique at the Saint-Placide gallery in Paris, he shares the award with Bernard Lorjou. 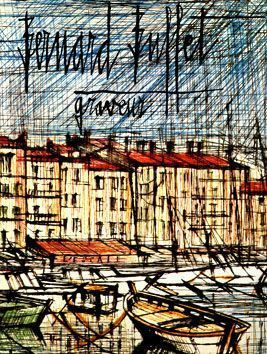 1951 - Bernard Buffet moves to the Manosque region for three years. He also signs an exclusivity deal with the Maurice Garnier gallery in Paris. 1952 - Bernard Buffet illustrates "Les Chants de Maldoror" written by Lautréamont. In the following years, the artist dedicates much of his time and attention to the creation of prints, lithographs or etchings. His work also including illustrated books such as: "Recherche de la Pureté" by Giono in1953, "La Voix Humaine" (En: The Human Voice) by Cocteau in1957, "Les Voyages Fantastiques" by Cyrano de Bergerac in 1958 and "Jeux de Dames" with poems by Baudelaire and Rimbaud in1970 etc. 1955 - Bernard Buffet designs sets for "La Chambre", by Georges Simenon for Roland Petit's ballets. Buffet was elected the best post-war painter by the readers of the art magazine "Connaissance des Arts." 1958 - The first retrospective exhibition of Bernard Buffet's work takes place at the gallery Charpentier in Paris. The same year the painter marries Annabel Schwob who will be described as his muse. 1961 - Bernard Buffet paints images of Christ, these paintings are exhibited 10 years later in the Vatican. 1962 - Bernard Buffet designs sets for Carmen (by George Bizet) for the Marseille Opera. 1965 - Bernard Buffet moves to Brittany where he will live for 5 years. 1971 - Bernard Buffet is decorated with knighthood in the Legion of Honour. 1973 - The Bernard Buffet Museum is inaugurated in Surugadaira in Japan. 1974 - Bernard Buffet is elected and takes a seat in the Académie des Beaux-Arts. 1978 - Bernard Buffet etches a 3 francs stamp at the demand of the French Postal Services. 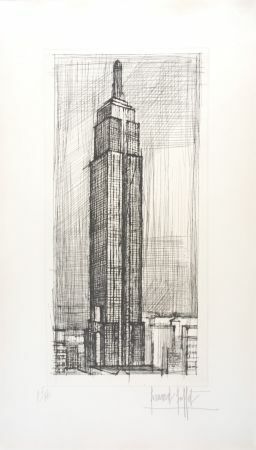 In connection with this the French post presents a retrospective exhibition of his work. 1999 - Bernard Buffet commits suicide in his home in Tourtour, Var region, France. 1952 - Gallery Maurice Garnier, Paris, France. 1959 - French Institute, Berlin, Germany. 1963 - Museum of Modern Art of Tokyo, Japan. 1968 - Gallery Maurice Garnier, Paris, France. 1970 - Gemeentemuseum of Wieger, Holland. 1991 - Pouchkine Museum, Moscow, Russia. 1992 - Ermitage Museum, Saint Petersburg, Russia. 1994 - Documenta-Halle of Kassel, Germany. 1996 - Beaux-arts Museum of Kaoshiung, Taïwan. 1998 - Gallery Maurice Garnier, Paris, France. 1949 - "Bernard Buffet" from Pierre Descargues, Ed. Presses Littéraires de France. 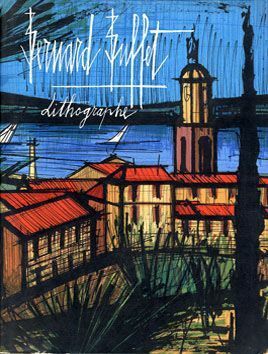 1954 - "Le Paysage a quatre siècle et Bernard Buffet vingt-quatre ans" from Louis Aragon, Ed. Lettres Françaises. 1964 - "Bernard Buffet" from Maurice Druon, with notes by Annabel Buffet, Ed. Hachette. 1994 - "Bernard Buffet : Secrets d'atelier" from Jean-Claude Lamy and Annabel Buffet, Ed. Flammarion. 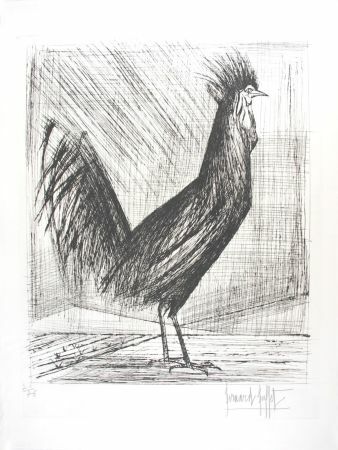 "Bernard Buffet Graveur, 1948-1980" is the catalogue for all the etchings of the artist. Published by de Francony. "Bernard Buffet lithographe", in 2 volumes (here the first one reproduced) reproduced all the original lithographs made by Bernard Buffet (more than 500). This catalogue had been made by Charles Sorlier and published by André Sauret.